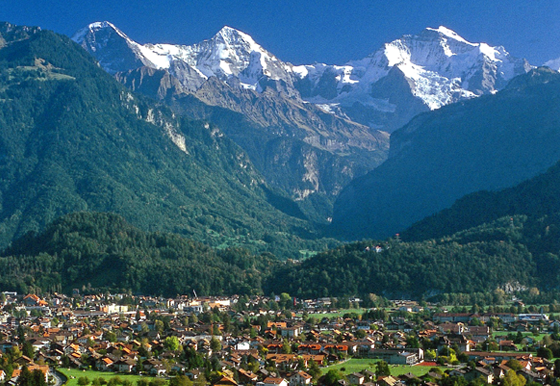 Interlaken was once the base for many Victorians to explore their extravagant desires; castles, gardens and arresting European scenery all make for an excellent home for royalty. An interesting juxtaposition can be found here, the peaceful stillness of the mountains and glittering lakes are used by daredevils looking for some adrenaline based adventures. For those who do want to appreciate the surroundings at a more steady space and absorb the cultural identity found here then there are a whole host of options for you to explore, here are just a few of those. Interlaken is very much a fairy tale setting and this is best displayed through five fully preserved castles which are dotted around the region. Along the edges of Lake Thun, these five grandiose structures exude a class and style so befitting of the area. The castles can be found at Spie, Hünegg, Oberhofen, Schadau and Thun, strolling through the premises is a great way to reflect on a bygone age when the nobility had to face such hard problems as deciding which wing of their castle to spend the day in. Each castle offers incredible panoramic views of the Bernese Alps. You can get tours that start out on Lake Thun and take you on a voyage to some of the medieval and Baroque architecture that is displayed there. Spiez Castle is comprised of a Romanesque church, medieval fortress and gothic palace while Oberhofen Castle is more akin to a museum of 16th to 19th century Bernese decor. Thun and Hunegg Castles also offer examples of architectural historicism, and feature small museums of furnishings and decor. Found on the Schynige Platte (The Plateau), the Alpine Garden boasts over 500 types of flora. A cog-wheel train journey from Wilderswil to the 1967m high plateau will make you succumb to Interlaken’s charms which will see you observe magnificent views of the green vistas that spread out as far as the eye can see. Admire the immaculate abundance of alpine flora which includes Edelweiss. While you are there you might want to make sure you make a stop off at Teddyland. Unfortunately, this is not an artificial world run by teddy bears which sees them anthropomorphised, and do things like factory jobs and become lawyers. It is the next best thing though, a home to a truly huge collection of teddy bears, both old and new. Of course once on top of the plateau, there is a wealth of hiking and trekking options which are divinely back dropped by sensational alpine views. The Panoramaweg is an easy two-hour circuit, while the trail to Grindelwald-First is one of the best in the region. If you're here in July or August, don't miss the moonlight hikes. The Old Town of Unterseen really evokes images of a traditional, yodelling led Switzerland which is uninterrupted by the mundanity of modern life. A relaxing stroll along the River Aare will take you across the Aare Sluice which leads you into the Old Town, this antiquated quarter is awash with sites that include a 13th century church, a rustic old town hall, square and a museum for the Jungfrau region. The Old Town has absorbed all the beauty which is granted from Interlaken’s fortunate position of being just between the glittering Lakes of Thun and Brienz as well as the pearly whites of Eiger, Mönch and Jungfrau. From the old town, you can take Marktgasse to the centre of Interlaken and the Höheweg and on to the Höhematte. Stroll on eastwards along the Höheweg past the Japanese Garden to the fortified walls of the former monastery with its castle and castle church to really get a sense of what makes this region so special. For the very best views of Interlaken, as well as Eiger, Mönch and Jungfrau then look no further than Harder Kulm. Many sacred paths can be found here for devout hikers, and if you want to stretch your legs you will be pleasantly surprised by the walks on offer. Look out for the wildlife park near the Valley Station too which is home to furry Alpine creatures that include marmots and ibex. At a height of 1322m above sea level this is easily the best place to enjoy the Interlaken’s panorama. And for those with a head for heights, the Two-lake Footbridge, which opened in October 2011, is the ideal vantage platform. The short journey from Interlaken to the Harder Kulm, , takes only eight minutes by cable car and it is certainly well worth the trip. Awaiting you at 1322 m above sea level is the Two-lake Footbridge and offers stupendous views of neighbouring peaks as well as Lakes Thun and Brienz.